Prospective analysis of aquaculture development: the Delphi method. Prospective analysis of aquaculture development. FAO Fisheries and AquacultureTechnical Paper; No. 521. Rome, FAO. 2009. 104p. 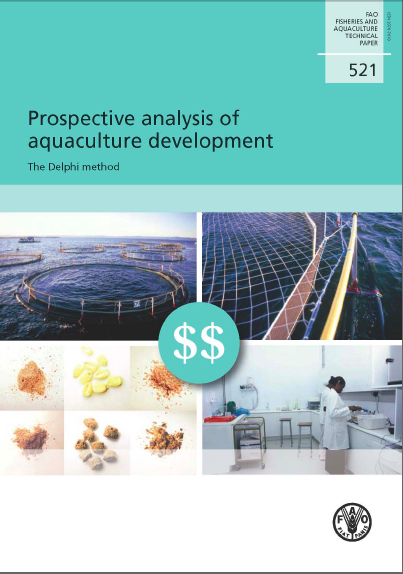 In order to evaluate the major impediments to aquaculture development in different regions of the world and to indicate opportunities for expansion, a Delphi analysis was undertaken. The Delphi method is particularly useful for sectors such as aquaculture where discontinuities exist and where historic trends cannot be easily extrapolated into the future. The recent global expansion of aquaculture is unlikely to continue at the same pace; however, certain regions have underexploited resources and offer considerable potential. The Delphi method allowed experts in different regions to indicate where the potential and constraints are; they were also encouraged to offer their policy solutions. Experts from Latin America and the Caribbean were particularly optimistic about opportunities for future aquaculture expansion in their region. With a plentiful natural resource base and sufficient demand for fish products, their principal concern was lack of financing and of human capacity. Other regions such as Eastern Europe were less sanguine partly because of problems with species or with external factors such as negative public perceptions towards aquaculture. However, there was a consensus in all regions that aquaculture should be encouraged. Reasons given ranged from the contribution of aquaculture to food security and poverty alleviation to the role of aquaculture in reducing pressure on wild fisheries. 3.1 Should aquaculture be encouraged and why? 3.2 What factors have contributed to the positive development of aquaculture in the past ? 3.3 What factors affected aquaculture development negatively in the past – will they become more determinant over time ? 3.4 What are the “unexplored opportunities ” that would have a very large positive impact in regions?